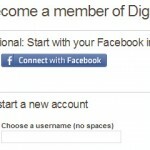 Login and registration forms are a good spot to look for ways to improve their usability. On some sites, the registration is the most important goal for the site owner. Whether you are using these registration forms as part of the checkout process, or a way to share personal content, one of the keys is making them simpler. A common issue with these forms is that a user is given a choice between logging in, or registering for the first time. A very simple way to approach this is found on GoMockingbird.com. Once an email address is typed in, an AJAX call checks if your address is new or old. 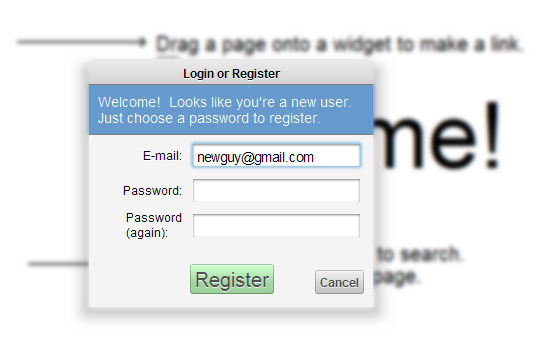 Visitors with unfamiliar email addresses (presumably new users) are immediately shown a slightly modified form (shown below), while old users don’t see any changes. A newer option in the logging in world is utilizing Facebook Connect. This doesn’t remove elements of your form, but for anyone with a Facebook account, they suddenly have a very simple option. 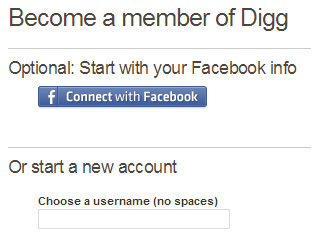 Below Digg.com is asking whether I want to start with Facebook, or make a user name (even better, they could simply ask for my email address to start). I simply click the Connect button, a confirmation button appears, and I’m sent back to my Digg news. If you’re going to accept Facebook Connect for user registration though, don’t demand other information right away. 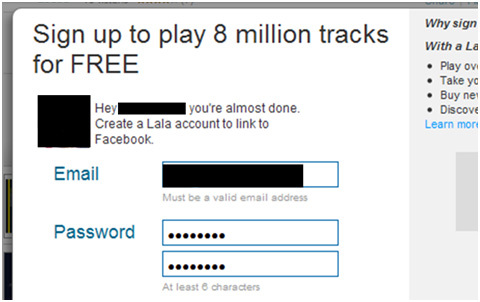 Lala.com, for example, had me sign in to my Facebook, and then asked me more questions. Ask later already, I just wanted to hear some damn song! The good news is they pre-populated some of the form. Many options are available for dealing with user login and registration in the shopping cart. It’s additionally complicated because you might also have guest checkout as a third option. Amazon makes the new user registration process simplified by asking for a password later. In fact, they make you feel casual about it by saying “you’ll create a password later.” They even tell you it is “quick and easy,” which beats time-consuming and complicated. On a multi-step checkout process like this, asking for minimal information is very important, as customers perceive the process as easy right from the start. If you’re looking at a single page checkout process, that is another opportunity to consider AJAX as well (http://www.getelastic.com/single-page-checkout/). For login and registration forms, don’t bother users with a bunch of questions so you can try and sell them more stuff later. If you had a hot dog stand, you would just let a guy buy a hot dog if he wanted. You wouldn’t make him tell you his birthday and ask if he wanted to subscribe to your hot dog-related newsletter. Just get the visitor to complete the task; you can ask for other information later, in subsequent visits, or in an email. Depending on your site, consider the options made available with AJAX, Facebook Connect, and multi-step and single-step checkout processes.